We meet a lot of people in life. Starting with the first faces that we see when we are born, for instance, our parents. I know what you are thinking. But no, it's not the one who caught us on the way out, our uncles, and our grandparents. And for some of us that didn't have the luxury of enjoying being spoiled by a grandpa, still in life we come across people that in a way or somehow will become as one of the above mentioned without even being part of our own family. They don't have any kind of relation with any other relatives and sometimes we wonder, "why is she/he not my real grandpa or grandma?" For instance, at the time when I got married with the most beautiful woman of the neighborhood; yeah, believe it or not. And no, I'm not just saying that because I was in love or infatuated with her. But because she was in fact, and still is, a beautiful woman. A lot of guys were after her, she just didn't know it. Because of her, I met a lot of people and among all those people there was la Señora Francisca, or "Doña Francis" like my ex used to called her. La Señora Francisca was an old friend of my, back then, wife. She was an older woman that my wife met when she was still single. Later on she introduced me to her. 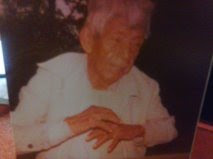 Francisca's father was an old man from the Mexican Revolution time. A very rich old man. Rich to the point that he didn't even know how much he had, but his kids knew. He owned a lot of land and Francisca's house was built on one of those extensions of land. Next to it was this little shack constructed from palm trees leaves, mud, and wood. I know, it sounds ugly. It was about 35 by 45 feet, with just dirt as a floor. He had a lot of fields of "caña de azucar" (sugar canes) growing; which at that time, he used to still take care of while riding on his horse like in the good old days. He was always very nice to us and we used to visit them once in a while. And in time, we started developing a very good friendship. didn't have. This is how we got our grandpa. Maybe it was late for us. But still, we got to enjoy it while it lasted. As time went by, we moved to another town and life continued its course. We always remembered him. Maybe some of you got some relative in a similar way. Well, maybe not exactly, but you know what I'm talking about. So, you all just keep reading, be patient, there's more coming, don't forget to eat your vegetables. Stay safe and healthy and if you can't read me soon. . . you'll read me later. Over n' out. 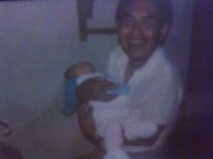 the pictures: "El abuelo", mi padre con mi hija Fabiola, y uno de mis mejores amigos, Memo con mi supernieta Sophia. HI there my friend,i did as i promised checked out your blog. Well it's always nice to have someone to call granpa or gramma when they are not blood relatives. I have know some people that have had that kind of relationship with persons in their lifes. Though i have been fortunate to have grand parents in my life. I still have my materal gramma, she has been a blessing in my life. Well my friend as you always write, (over an out) see you later.